Kids get disappointed. It’s a fact of life. Helping kids learn how to handle life’s disappointments when they are young serves them throughout their lifetime. Kids are never too young to learn self-regulation skills. This resource provides a very powerful mix of strategies (culled from Cognitive Behavioral Therapy) to help kids build resilience and bounce back from disappointment. Combining thinking, feeling and behavior strategies, this resource helps kids gain a new perspective. The interventions are proven effective to help and represent best practices in behavioral health for kids. These strategies have helped in clinical settings, as well as in schools and homes. More than 50 pages of content. Therapeutic-grade interventions, suitable for home, classroom, counseling, group or scouting use. 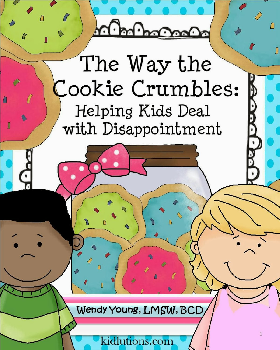 9 Tips for Parents, Educators and Therapists and Group Facilitators on Helping Kids Deal with Disappointment. Workbook/handouts with page options for younger and older students (K-5). Pick the handouts, pages that work best with your age group. Includes options for writing or drawing responses. Worksheets/activities that combine all strategies together. *Note: These concepts work equally well for young children, however, the adult/caregiver will obviously have to read and explain the concepts. Worksheets/activities suitable for young children are included. This resource is perfect for parents with kids of multiple ages, educators in multi-age classrooms, Child and Adolescent Therapists, Marriage and Family Therapists, School Social Workers, Family Life Specialists and MORE!